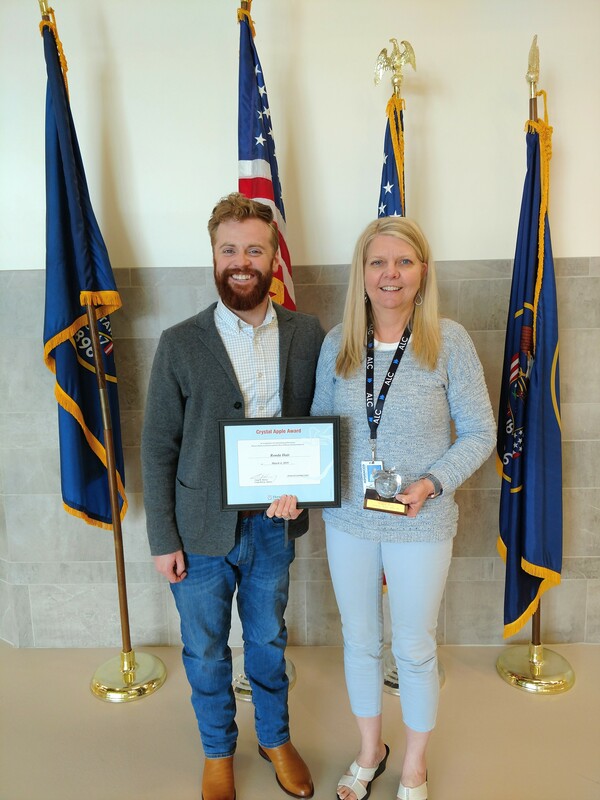 On Monday, March 4, 2019, the Crystal Apple Award was presented to Ronda Hair of the ALC. It was presented to Ms. Hair by Craig R. Harvey representing Horace Mann, and also Mr. Mark Halls. The Crystal Apple Award is given to teachers that show devotion to students and outstanding performance in the classroom and is awarded by nomination from the school faculty. Ronda has dedicated her career to student success. Ronda has the unique ability to recognize the potential in all students. She ensures all students are given every opportunity to succeed. It is not uncommon for Ronda to make house calls, spend countless hours after school, track down students in parking lots, and even bring an extra meal for a student she knew would not get dinner. Ronda doesn’t just take care of her students, she also looks out for her co-workers. I know just where to go if I spill on my shirt, can’t get rid of static cling, break a heel on my shoe, have a bad hair day, or even need a diagnosis for some strange illness. Ronda can love the unlovable, coach the un-coachable, and teach the unteachable. She has made a lasting impact everywhere she has been. I am fortunate to have had to opportunity to know and work with her, and cannot think of anyone more deserving. THE FACULTY AND STAFF HERE AT THE ALC COULDN'T AGREE MORE WITH THIS TRIBUTE. She received her Master's Degree from SUU. THANK YOU FOR ALL YOU DO RONDA.